Custom bags and cases are excellent products to manufacture with our durable fabrics. When manufacturers ask us which fabrics to use for bags or cases our sales consultants first listen to their goals for function, capability and pricing. Then, depending on the project requirements we most often recommend one or more fabric choices from the following list of top bag and case fabrics. A brief summary of each fabric category is listed below, along with the links to each product page for more information. Want to see for yourself? Request a sample today by calling one of our sales consultants at 855.618.4500 or leave a message on the web by clicking the red help button on the right side of this page and we'll be in touch with you soon. 1050 Denier Ballistic Nylon The basketweave of our 1050 Denier Ballistic Nylon combined with the resilient nature of the INVISTA™ yarns makes this our best-selling ballistic nylon. This is also our toughest ballistic nylon and it is often used for making long-lasting duffel bags, luggage,custom bags and cases. 1680 Denier Nylon Basketweave Our 1680 Denier Ballistic Nylon is a tough, synthetic basketweave fabric. This heavy duty nylon fabric's abrasion resistance and durable construction make it a top-performing choice for rugged applications where strength and abrasion resistance are a high priority. CORDURA® fabric (500 Denier or 1000 Denier CORDURA®) Widely recognized for durability and versatility, our nylon CORDURA® fabric offers excellent abrasion resistance and tear strength. These fabrics are a popular choice for manufacturing heavy-duty backpacks, sport and duffel bags and a wide range of custom bags and cases, with 20 stocked colors. 1000 Denier Textured Nylon 1000 Denier Textured Nylon is a heavy-duty nylon fabric finished with a clear polyurethane back coating and durable water repellent finish. Our 1000 Denier Nylon is a cost effective nylon fabric for a variety of applications including luggage, sport and duffel bags, backpacks, wallets and briefcases. This fabric is stocked in 14 colors. Magnatuff Ultra Nylon™ Our Magnatuff Ultra Nylon™ was engineered as a cost effective alternative to other popular heavy-duty nylon fabrics. This heavy-duty nylon fabric is finished with a clear polyurethane back coating and durable water repellent finish. Magnatuff Ultra Nylon™ is used for a variety of applications such as luggage, sport and duffel bags, backpacks and briefcases. This fabric is stocked in14 colors. Nylon/Polyester Mini Diamond Ripstop. Our Nylon/Polyester Mini Diamond Ripstop is a versatile, lightweight fabric constructed with a polyurethane coating and water repellent finish. This ripstop fabric is a popular choice for manufacturing luggage, bags and various custom cases, and it is stocked in 12 colors. Nylon Pack Cloth This water repellent nylon fabric has a DWR finish and a clear polyurethane back coating. 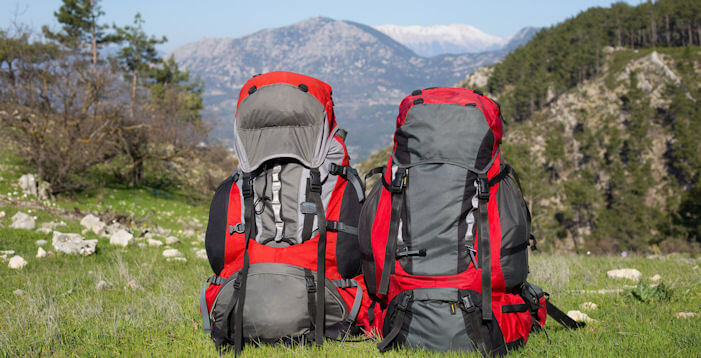 These characteristics help make our Nylon Pack Cloth ideally constructed for making colorful backpacks, duffel bags, sporting equipment cases, laundry bags and a variety of custom bags and cases. We stock 27 colors and two popular constructions of Nylon Pack Cloth. Nylon Oxford Cloth Our Nylon Oxford Cloth is a lightweight, flexible nylon fabric stocked in two popular constructions. This fabric is often used for manufacturing colorful linings, promotional bags and laundry bags, with 20 stocked colors. 70 Denier Nylon Taffeta with PVC Backing Our 70 Denier Taffeta Nylon fabric with PVC Vinyl backing is a medium-weight, waterproof fabric. Due to the durability, weight and waterproofness of this fabric, it is commonly used to manufacture bags, purses and cases. This fabric is stocked in 7 colors. CORDURA® HP One of the newest fabrics from CORDURA®, this polyester offers the performance and durability expected from CORDURA® fabrics at a competitive price point. CORDURA® HP is used to manufacture rugged backpacks, travel bags and custom bags, with 6 stocked colors. 600 Denier Magnatuff™ Polyester Our 600 Denier Magnatuff™ is a durable polyester fabric with a polyurethane back coating. This urethane coated polyester is versatile and is commonly used to make luggage, sport and duffel bags, purses and various custom bags and cases. This fabric is stocked in 19 color styles, including Backwoods Camo. 600X300 Denier Polyester with PVC Backing One of our best-selling polyesters, this multipurpose fabric is engineered with a tough vinyl embossed backing and is typically used to manufacture bags and custom cases. We stock 18 color styles, including Woodland Camo. Natural Cotton Ducks Our Natural Cotton Duck Canvas fabrics range from 7 oz. Single Fill Duck to Army Duck up to 25 oz. in our heaviest number duck. The natural finish goods are often used for totes, duffels and other end applications. This natural material may also be dyed and finished to your specifications. Dyed Number and Army Ducks Our Dyed Number Duck is a popular choice for messenger bags and totes, and it is stocked in 14 colors. Our Army Duck fabrics are most often used for totes and lightweight promotional bags, with Army Duck stocked in Natural and Black, in addition to three colors with our Sunforger® finish. Polyester/Cotton Twill Poly/Cotton Twill is an ideal blend and weight for totes. This 65% Polyester/35% Cotton fabric is stocked in 8 colors, including our best-selling Khaki and Black styles.